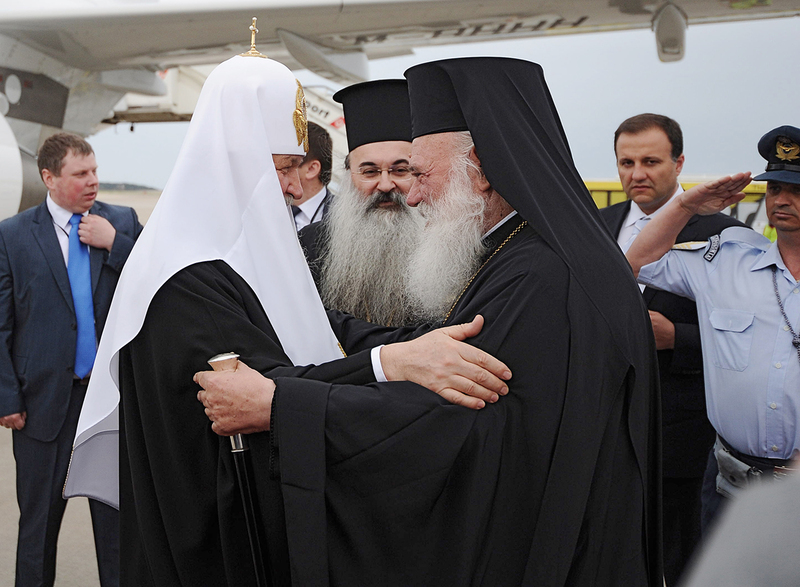 On 1 June 2013, His Holiness Patriarch Kirill of Moscow and All Russia arrived in Greece at the invitation of His Beatitude Hieronymus II, Archbishop of Athens and All Greece, and the Holy Synod of the Orthodox Church of Greece. Accompanying the Primate of the Russian Orthodox Church are Metropolitan Hilarion of Volokolamsk, chairman of the Moscow Patriarchate’s Department for External Church Relations (DECR); Bishop Sergiy of Solnechnogorsk, head of the Moscow Patriarchate’s Administrative Secretariat; Mr. Vladimir Legoida, chairman of the Synodal Information Department; archpriest Nikolai Balashov, DECR deputy chairman; archpriest Igor Yakimchuk, DECR secretary for Inter-Orthodox relations; protodeacon Vladimir Nazarkin, assistant to the DECR chairman; and Mikhail Kuksov, head of the patriarchal personal secretariat. Meeting the delegation at Athens airport Eleftherios Venizelos were His Beatitude Archbishop Hieronymos of Athens and All Greece; Metropolitan Prokopios of Philippi, Neapolis and Thasos, president of the Synodal committee on inter-Orthodox and inter-Christian relations; Metropolitan Chrysostomos of Peristerion; Metropolitan Nikolaos of Mesogaia and Laureotiki; Metropolitan Pavlos of Sissanion and Siatista; Metropolitan Dionysios of Korinthos; Bishop Prokopios of Christianoupolis; Bishop Gabriel of Diavlia; Deputy Foreign Minister of Greece Konstantinas Tsiaras; and H. E. Vladimir Chkhikvishvili, Ambassador Extraordinary and Plenipotentiary of the Russian Federation to the Greek Republic. The Primate of the Russian Church told representatives of the Russian and Geek mass media that he had always come to Greece in good spirits. He continued, saying: “Greece is an Orthodox friendly country which has maintained close relations with Russia and with all countries of Holy Rus’ for centuries. It was Greece that has given us Ss Cyril and Methodius, Equal-to-the-Apostles, who have commenced Russian literature. Greece played an important part in the Christianization of Russia, and Russia played an important part in the liberation of Greece later.